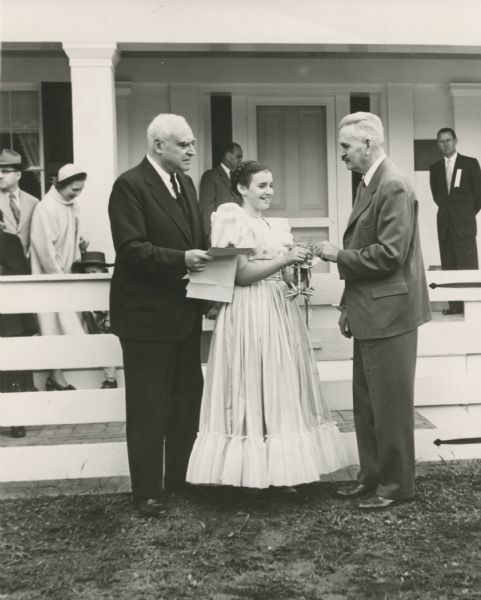 Ruth DeYoung Kohler II, presents the key to Wade House to Dr. William McKern, of the Wisconsin State Historical Society. The century-old stagecoach inn and adjoining buildings were purchased by the Kohler Foundation, Inc., in 1950, and restored under the direction of the young lady's mother, the late Mrs. Herbert V. Kohler. Her father, Herbert V. Kohler, chairman of the Kohler Foundation, is standing on the left. Other people can be seen standing behind the white fence and on the porch.